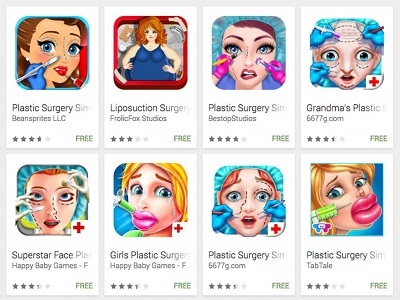 On your Android Play Store, you will come across Plastic Surgery Apps that asks the player to perform an animated face surgery on a cartoon character shown. One of the apps starts with a storyline, where a character is cursed by a witch first. Then a description shows up with the message that the witch has turned the character ugly, and you are the only one who could help them. Ending with a note to not to miss the opportunity to become a pro plastic surgery doc. Can you see where the app is going? While some of the apps do have an age restriction of 17 or more. But actually, there is no way of stopping kids younger than that installing the app on their parent’s phone. Asking on how people end up installing such apps, Christine who is working at the Common Sense Media who address tech concepts with a family context says: Most of such plastic surgery game apps are available for free, and this holds a big reason for people installing the app. On these apps, children could simulate processes like liposuction, lip filters, nose job, double-eyelid surgery, and others. Using such apps, children are being provided with the compulsion of looking fair or good. If something is not right on your face, fix it! That is what kids learn from such weird apps. On the other hand, there are apps which won’t look like the plastic surgery ones at first but as you proceed with the game – you will know it. Number one reason is that these apps don’t actually have any context. Just performing surgeries on the face and other body parts that will be confusing for the kids and even scary to some extent. Along with that showing the surgery in graphics are gross. It also spreads a negative message among the litter girls like- don’t you like your appearance? Then, go with the surgery as there is nothing as important as how you look. Well, I myself won’t let my kid see any surgical scene on TV, then how could I let them play the same on the phone? So, what the parents can do is to monitor the apps that your kids are using. If you are installing any game app, play the game for a while by yourself before letting them play. Hello there! When we talk about communication networks, it’s impossible to not to discuss the Wired and the Wireless communication. Also, recently their influence was highly seen in the utility industry as well. These industries are looking out for ways to increase their investment with the communication networks, in order to have a safe, secure transmission of data. The two common communication techniques are the Wireless type and the Wired network (fiber optic and other wired options like the copper cable). Though both the types have an equal presence in the market, the wireless technology remains the leading among the two. When we look at the Smart Grid application, the Wireless Technology can help in better and improved data transmission. It can be explained with an example. There is a recloser control unit which helps in detecting any faults in the electricity distribution channel. With the help of these recloser controls, you could alter the paths and skip on the problematic areas. This way, a simple automation could save power and even the time for you. It ensures optimized results with the assurance of smart grid performance. Quick Comparison between the Wired & Wireless systems! The wireless radio is the hard-built systems that work the best for the harsh environments and other life-death situations like the military applications. They are the most economical solutions among all the other communication platforms. In terms of the installation, the wireless one is easier to install than the wired cables. Coming to the maintenance: if you had to repair any damaged or broken cable, then the costs of the work will be too high. Whereas the wireless connections are almost free of any kind of maintenance. If a quality wireless system is installed, then you will rarely require any kind of service for that. What are the advantages of Applying the Wireless Data Radios to the Utility Industry? the owner of the industry could handle all the communications. of course, the budget remains in check. On the other end, there are Wired Data Radios which offers a reliable path of communication. They allow the owners to have better control over the communication, ensures secure data transfer, and it’s also a budget efficient communication pathway. Powered by Wordpress | © 2018 evgeny-goldin | All Rights Reserved.